Changes in surface water availability are the most obvious threats to farmers in drought prone areas. Barind tract (undulating uplands with red/yellow clay soils of northwest Bangladesh) is considered as one of the low output zones in terms of agricultural production. In addition to the quality of soil with less organic matter and water with high turbidity and low alkalinity, climate change aspects (drought, lack of sufficient surface water for agricultural production) leads the farmers of this region more vulnerable as compared to other parts. In spite of having increased cropping intensity due to the improvement in irrigation system, farmers are found with poor status of income and nutrition for the high cost involvement in irrigation. 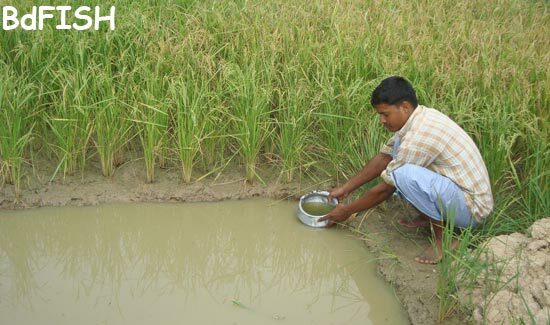 And hence integrated agriculture–aquaculture based farming in irrigated rice field ecosystem can be a good option to improve the status of the poor farmers under drought prone Barind area. Rice-fish culture is reported to increase yields while providing farmers with an important source of protein and extra income. An overall increase in soil nutrients of 15.6-38.2% is obtained from rice fish system. 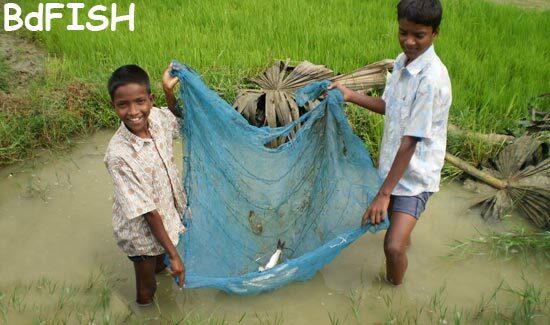 Thus integrated rice-fish system is found with a proven technique to increase the production and income, improve the soil quality and reduce the pesticide use. 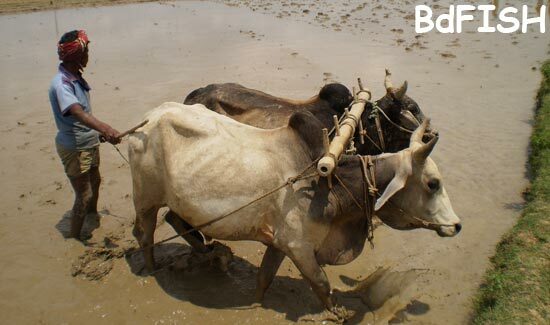 Unfortunately, benefits from rice-fish farming are not explored well in our research system especially in Barind area. This study evaluated the production and economics of fish farming in irrigated rice fields in drought prone Barind area. 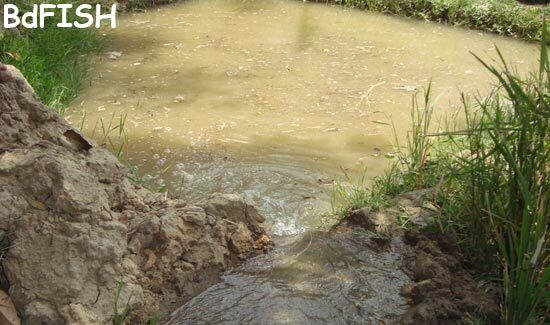 The specific objectives were to monitor the soil and water quality, evaluate the production and economics and recommend suitable strategy for the development of fish farming in irrigated rice field. 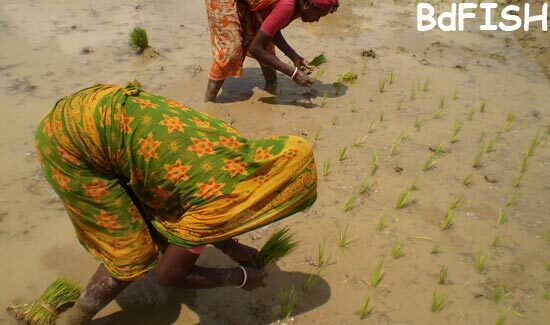 The study was conducted from March to June, 2009 in eight irrigated rectangular rice fields located at Basantapur union (Godagari, Rajshahi) with an average area of 0.14 ha. The source of water was deep tubewell. Four treatments were designed (T1. mono culture of rice (control); T2. integrated farming of rice and tilapia; T3. integrated farming of rice, tilapia and carps and T4. integrated farming of rice and carp). All the treatments were run in duplicate. The fields were ploughed by power tiller and leveled by ladder. Weeds were removed manually. 1.5 m х 1.5 m х 1 m size ditch was excavated. The rice fields were fertilized with urea, triple super phosphate (TSP) and muriate of potash (MP) at the rate of 200, 100 and 20 kg ha-1, respectively and also cow-dung (1500 kg ha-1). The rice (BRRI Dhan 28) were transplanted and fishes were stocked (at 5000 fishes/ha) after 15 days of paddy transplantation. The stocking combination for surface, middle and bottom feeding fishes was maintained as 2:2:1 for treatments T3 and T4. The mean initial weight of fish was 20.00±0.00 g, 64.16±5.83 g and 76.00±3.00 g with the treatments T2 , T3 and T4, respectively. Fishes were grown for a period of 120 days in the plots. Water quality parameters were monitored fortnightly. Rice was harvested from the fields after the period of 135 days of rice plantation. Just after harvesting of rice, fishes were collected from each rice plot, counted and weighed. Soil quality in terms of changes in organic matter (%) was monitored before stocking and after harvesting of fishes in the rice plots. Finally yield, financial returns, financial costs and net benefit of each culture system were calculated. Before fish stocking, the amount of organic matter (%) in rice fields were varied from 0.59 % (integrated farming of rice and carp) to 0.75 % (integrated farming of rice, tilapia and carp). After fish harvesting, the amount of organic matter of the experimental rice plots was increased as double. Mean values of water quality parameters including water temperature, water transparency, pH, dissolved oxygen, free carbon-dioxide, ammonia-nitrogen and total alkalinity of rice-fish system varied from 35.03±0.84°C (T2) to 35.84±0.72°C (T4), 14.59±0.59 cm (T2) to 15.91±0.59 cm (T4), 6.34±0.03 (T2) to 6.81±0.00 (T4), 2.92±0.05 mg/l (T2) to 3.54±0.03 mg/l (T4), 11.34±0.09 mg/l (T4) to 12.34±0.01 mg/l (T2), 0.30±0.02 (T3 and T4) to 0.34±0.00 mg/l (T2) and 10.50±0.00 mg/l (T2) to 11.88±0.19 mg/l (T4), respectively. Production, cost, return and benefit: Rice and fish yield under different treatments are shown in table 1. 306.28 kg/ha (T2) to 340.86 kg/ha (T4) fish yield was obtained (Table 1). Table 1: Variation in mean values of growth parameters of fishes under different treatments ( T1, T2, T3 and T4). Based on the aforesaid results and discussion, it can be concluded that irrigated rice fields under drought prone Barind area can potentially be used for fish farming. Hence, tilapia can be a good option while selecting aquaculture species for rice field in this zone. Dr. Akhtar Hossain, Associate professor, Department of Fisheries, University of Rajshahi, Rajshahi-6205, Bangladesh. Visited 1,049 times, 1 visits today | Have any fisheries relevant question?